I am planning to change this blog’s theme in the next few days, since the current Twenty Ten theme is not friendly to long nested comment threads. I am hunting for various free WordPress themes and will make decisions soon; I’m looking for somewhat smaller fonts so that more text can fit per line, but also less indent between comments (compare comment threads here today with threads on Second Avenue Sagas or California HSR Blog). Keeping the reverse chronology is a must – I emphatically do not want a theme that makes people click on posts to be able to see them at all. If people have opinions, I am listening. Update 7/23: hey everyone, go read Queens Transit, both for the regional rail posts (which I don’t fully agree with, but think are thoughtful and interesting), and for the theme; it looks like just what I need. Update 7/25: I narrowed it down to a few themes, and chose Blaskan. I no longer live in Vancouver. I am leaving the city tonight, heading to New York and New Haven until July 8th (email me if you want to meet). I will then travel to Europe: I got a two-year position at the Royal Institute of Technology (KTH). As Stockholm has tight rent control, expect a post on that subject once I’m settled in there and have gotten the chance to talk to people. I do not know many people who live in Boston proper. I know about a hundred who live in the Greater Boston area, but only a small minority lives in the city proper, as is of course true in general. I know many people who live in Boston suburbs or in secondary cities like Worcester, but the largest concentration lives in the urban parts north of the river: Cambridge, Somerville, and Watertown. This is true even if I exclude everyone with Harvard or MIT affiliation. In the geek community, Boston proper is where Chinatown is and where the train station is; the social centers are around MIT and Harvard, the jobs seem to be centered in Cambridge as well, and Brandeis graduates often gravitate toward Cambridge and Somerville. What this means is that I don’t know what people in Greater Boston think about things very reliably. I know the attitudes in Greater Cambridge, or at least the part of Greater Cambridge that goes to conventions. Just as the Providence I inhabited was really a Greater East Side, one in which more people know more residents of Back Bay than of Olneyville, the Greater Boston I inhabited is a specific subculture that’s very active in New England, with specific attitudes that aren’t found elsewhere. For example, support for public transit is quite high, while at the same time enough events don’t and can’t take place in the urban core that people still figure cars are needed, leading to a culture of carpooling. I keep being reminded by this every time I read pieces by Aaron Renn about attitudes in a city. His latest piece about gentrification is a more subdued example since he talks mostly about the actual effects of gentrification, but the point about people’s attitudes toward it is still there. An earlier piece about Rhode Island mindsets is more indicative. To Aaron, people in and around Providence identify with the state or with their local town rather than with the region. The people I have met are not like that, and often live in southern Massachusetts while still identifying with Providence somehow. For example, one of the Waterfire performers performs in Plymouth and Providence (and Providence is the bigger draw) and lives just outside the census-defined Providence metro area. For another example, I know a recent Brown graduate who is from a Providence suburb of Massachusetts who identifies with Rhode Island and southern Massachusetts, having gone to another college in Providence and to grad school at Brown. But the same difficulty of generalization of course affects the elites as well as people who perceive themselves as normal. If Aaron’s experience talking to urban development leaders is indicative of what they too think, then their social circles also consist mainly of other urban development leaders and their immediate families. There is nothing inherently wrong with that, but there is a real danger of overgeneralizing from an unrepresentative social network. Aaron himself doesn’t do this, but people in positions of power do. The New England I inhabited was a bubble in which downtown Boston didn’t really exist; the Providence that the power brokers seem to inhabit is one in which it is more important to improve transit access to the Jewelry District than to South Providence and Olneyville. I say this as someone who in a year in Providence visited Olneyville once and South Providence never, but because I never saw myself as representative of transit riders, I formed opinions based on where preexisting ridership is and where usable rail infrastructure is and not on gut feeling about where service should go. We all have subcultures, but some subcultures think of themselves as more normal than others, and a few think of themselves as not subcultures at all but as representative of everyone. I live about 3 minutes from an express bus stop, where I can get the express bus and be at UBC within 15 minutes, whereupon I can walk from the diesel bus loop to my classroom in 6 minutes. Since I teach at 10 in the morning, it means I should leave around 9:30 or just before and then with rush hour headways I can be guaranteed not to be late to my own class. Unfortunately, because classes start on the hour, everyone wants to ride the last bus that makes the 10 am classes, and by the time this bus gets to my neighborhood, it is full. To guarantee getting on a bus I need to be at the bus stop by 9:20 or not much later, which since I have no real reason to show up to campus 15 minutes ahead of time lengthens my effective commute to 40-45 minutes. A bus that is in principle faster door-to-door than any proposed SkyTrain extension, which would serve my area at a much farther away station, becomes more than 10 minutes slower at the time of day relevant to me. Vancouver has a general problem with passups – that is, passengers at a bus stop who have to let a full bus go. A list of the bus stops with the most passups is dominated by UBC’s peak caused by classes starting and ending at a synchronized time: eight of the top ten stops are for east-west buses serving UBC, and at those stops the passups are concentrated in the AM peak for westbound buses and the PM peak for eastbound ones. Of those eight stops, two, on the 49, are partially connections to the Canada Line (compare passups east and west of Cambie here), but the six on the 99-B are not, since a sizable fraction of riders ride end to end and there are substantial passups west of Cambie as well. The demand generated by a traditional CBD can be smoothed with flex-time work and with a general spread of the peak around a peak half hour. With a university this is not feasible: to ensure maximum flexibility for students’ class schedule classes should be synchronized. When I was at NUS, a commuter university like UBC, I had a similar problem with full buses heading from campus to the subway stations after classes. Because UBC is nowhere near SkyTrain, its demand has to be spread among many bus routes, and is so great that it’s clogged not just the 99-B but also parallel routes such as the 25 and relief lines such as the 84. The only alternative for investment in the Broadway corridor that has enough capacity to meet this demand is a full SkyTrain option. Any option that relies on a connecting bus part of the way not only won’t solve the capacity problem, but might even make it worse by concentrating all the UBC-bound demand at the westernmost SkyTrain station on Broadway, at either Granville or Arbutus. Today, people who take the Millennium Line can use the 84, which is faster than the 99-B; any extension of the Millennium Line west, even just to Cambie to complete the gap from Commercial to the Canada Line, is likely to concentrate demand on one corridor, overwhelming the truncated 99-B even further. A light rail option probably has enough capacity, but does very little for Central Broadway or for completing the SkyTrain gap, and would also require pedestrian-hostile reconfiguration of stoplights and left turn cycles, making crossing the street even harder than it already is. UBC, which doesn’t care about Vancouver’s own needs, advocates an all-light rail option, while the city, which doesn’t care about UBC’s, wants a subway initially going as far west as Arbutus with a bus transfer to the west. A combo option with SkyTrain to Arbutus and light rail the rest of the way exists (Combo A in the alternatives analysis), but is almost as expensive as a full subway. The ridership projection for the combo option is almost even with that of a full subway, but such a projection is based on optimistic assumptions about transfer penalties and passengers’ willingness to travel on slower transit: the combo option is slower by about 7 minutes than the full subway from most preexisting SkyTrain stations as well as from Central Broadway, and requires an extra transfer for people traveling from the Millennium Line or Central Broadway. Because the project has a $3 billion price tag, various critics have already begun complaining that it’s needlessly expensive (in reality, the inflation-adjusted projected cost per rider is the same as those of the Millennium, Canada, and Evergreen Lines) and proposing inferior solutions, and I believe that this cost is why the city and Translink are thinking of truncating the extension to Arbutus and only doing the rest later. It’s fine to spend a higher sum on the combination of the Canada and Evergreen Lines, which look nice on a map and make a lot of suburban mayors happy, but when it’s just one line that more or less stays within the city it’s too expensive and needs to be chopped into phases. The other issue is that SkyTrain extensions have been more about shaping than about serving, i.e. serving areas that can be redeveloped rather than ones that are already dense. Look at the density map by census tract here: the residential density on Central Broadway and in the eastern parts of Kits is high, comparable to that of the census tracts hosting most SkyTrain-oriented developments. Even as far west as Alma there’s fairly high residential density. However, this is low-rise density, distributed roughly uniformly in the census tract, rather than clustered in a few high-rise buildings next to the SkyTrain stations. High-rises are possible throughout the corridor – there already are a few near the future Alma and Sasamat stops – but because of Point Grey’s affluent demographic it’s easy to write it off as not densifiable. Empty or very low-density plots are easier to redo from scratch than an existing neighborhood, even if the neighborhood already has enough development to justify a subway. I suspect part of the problem comes from the context in which Vancouver’s TOD is located in. The Expo Line follows a private right-of-way with pedestrian-hostile streets connecting to stations, and the Millennium Line is elevated over the mostly sidewalk-free Lougheed Highway. The fastest way to get from some houses that are close to SkyTrain on a map to the station is to walk through mall parking lots. The walking range of SkyTrain stations located in unwalkable parts of Burnaby is not as high as it would be at ones located in a walkable urban context. At the level of how many people would live within a kilometer of SkyTrain, Kits and Central Broadway are already outperforming most of the Expo Line’s TOD, and even at the 500-meter range they do quite well; but in Burnaby the relevant distance is much shorter, and this may affect Translink’s ridership projections elsewhere in the metro area. The only medium- and long-term solution is to find the $3 billion for the UBC extension, just as the metro region will have spent $3.5 billion in 10 years on the Canada and Evergreen Lines. Nothing else works for both UBC and Central Broadway; the counterarguments are based on generalizing from a different urban context; the difference-splitting intermediate solutions make some of the transit problems even worse than they are. It is always wrong to downgrade projects just because of a sticker shock, and if a very large project still has a good cost-benefit ratio then it’s a good investment to raise taxes or borrow money to fund it. In most models I have seen, ridership and mode choice are assumed to be symmetric: if I take the bus to work, I will also take it back home. Of course those models distinguish home from work: if a bus is full inbound in the morning it’s not expected to be full outbound in the morning. But the assumptions are that if the bus is full inbound in the morning, it should be full outbound in the afternoon. To a first-order approximation this is fine, but there are multiple situations in which people can choose differently in each direction. This is less relevant when discussing cars and bikes, because if you use them in one direction you must use them in the other, but it’s relevant to car-share, bike-share, various kinds of buses and trains, walking, and flying. Most of this post will take the form of anecdotes. I have not seen any model that accounts for these cases, or any discussion elsewhere. The only exception is when large changes in grade are involved: people walk or bike down more easily than up, and this means that in bikeshare systems, the operators sometimes have to tow bikes back to high-elevation neighborhoods because people persistently take them downhill more than uphill. However, in addition to asymmetry caused by physical geography, there’s asymmetry caused by urban layout and transit system layout, as well as asymmetry caused by different characteristics of trips. Consider the above image of a transit network. Point A is a major destination; area D is a neighborhood, and point E is an origin. 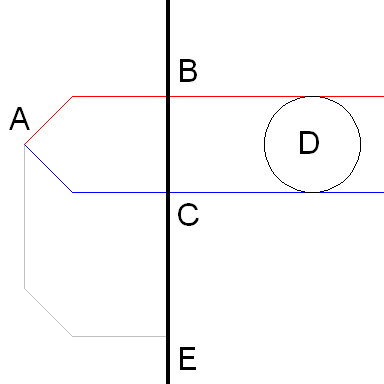 The thick black line is a rapid transit line, passing through and stopping at B, C, and E. The red and blue lines going east from A are frequent rapid bus lines. The gray line going from A to E is a lower-grade bus line: less frequent, and/or slower. In this image, traveling between A and either D or E, the frequent buses will be more useful going away from A than toward A. For an A-D trip, if I live in neighborhood D and travel to A, then I need to choose which of the two parallel streets to stand on, whereas going back from A to D, I can stand at the bus terminal and take whichever bus comes first. For an A-E trip, if I live at E and am going to A, then again I need to choose which of the two bus lines to use, that is whether to get off the rapid transit line at B or C, whereas going back this is not an issue. On the margin, I might choose to take the lower-grade but direct bus from E to A but not back. Neither of the situations is hypothetical. When I went to college at NUS, my situation was similar to the A-E case: while the subway has since reached campus, in the mid-2000s the campus was connected by buses to two separate subway stops, Clementi and Buona Vista, and although some parts were definitely closer to one than to the other, the connecting buses served all parts of campus relevant to me. There was no equivalent of the gray bus, and I’d almost always take a taxi to campus, but usually take transit back. Now that I’m in Vancouver and work at UBC, where bus lines converge from parallel east-west streets, my situation is similar to the A-D case, since I can take Broadway buses as well as 4th Avenue buses; there is no alternative to the buses for me, but if there were, for example bikeshare, or walking if I lived closer to campus, I might well use it. In those examples the asymmetry is for the most part unavoidable, coming from urban layout. In Vancouver, there are multiple east-west streets on the West Side that deserve frequent bus service. Consolidating everything on one street can come from the opening of a Broadway subway to UBC, but because the asymmetry is a second-order effect, the main argument for the subway has little to do with it. Some bus and train stations are notorious for being unpleasant to wait at. Tel Aviv’s Central Bus Station is dark and labyrinthine. In New York, Penn Station and Port Authority are both unpopular. Many older airports are infamous for their poor amenities and confusing layouts. Because people need to wait going outbound but not inbound, this could affect mode choice. In Vancouver, UBC has two separate bus loops, one for generally express diesel buses, and one for local electric buses; each loop has buses going on multiple streets, as in the above image. I find the diesel loop noisy and disorienting, and therefore avoid it, waiting at the electric loop or the next stop after the loops. Therefore, I usually take electric buses back home from UBC, while I almost always take diesels toward UBC. I have no direct experience with Kennedy Plaza, but other Providence-based bloggers think little of it; I think it was Jef Nickerson who noted that buses going on the same trunk routes are not co-located there. This could induce a similar asymmetry. It gets worse when bus stops do not have shelter from the elements. Sheltered stops should be included in any bundle of best industry practices, but when they are present only downtown or at major stations, they can bias me to take the bus in just one direction. Transit agencies can eliminate this asymmetry by making their facilities better. Usually the cost of shelter, clear signage, a bus bay layout that makes identifying the correct bays easy, and similar improvements is negligible, and the benefits are large. Of course, independently of any asymmetry there is no excuse for not having passable facilities, but in some cases, such as the UBC diesel loop, the situation on the ground is worse than it appears on planning maps and this worsens the passengers’ experience. For some trips – going to an airport or intercity train or bus station, going to a meeting, going to class, going to a workplace where I need to be there at a specific time – there’s a more pressing need for timeliness in one direction than in the other. This biases in favor of more punctual or faster vehicles, even if they’re more expensive or less pleasant. This manifests itself in airport choice (when flying out of New York, I strongly prefer rail-accessible JFK, while my preference for flying in is much weaker), willingness to transfer to save a few minutes of trip time, willingness to ride a more expensive but faster train (for example, the LIRR versus the E), and bus versus train decisions (trains are almost invariably more reliable, often by a large margin). The few times I used transit to get to NUS, I used the subway, whereas when I went back home I’d often use a trunk bus, which was slower but had a station much closer to where I lived. In this case, there’s not much the transit agency can do. If the bus versus rail issue is persistent, the best thing that can be done is encourage more mixed-use zoning and more symmetric morning travel demand, so that buses would be used in both peaks and not just in the afternoon peak and vice versa for trains. To the extent that the transit activist community has an opinion, it is strongly against one-way pairs, going back at least to Jane Jacobs’ criticism in The Death and Life. I’ve written briefly about them; Jarrett has written more extensively. One more issue is that if a bus route runs one-way on different streets (as a consistent one-way pair as in New York, or in a more complex arrangement as in Tel Aviv and Singapore) and I live closer to one direction than to the other, I might take it in just one direction. In Tel Aviv it was not a major problem because the bus I took to middle school run two-way in the segment relevant to me, but in Singapore it was an issue in both middle school and college: I lived next to a very wide one-way street without nearby crosswalks, and getting to the other direction of the buses required crossing it and walking some extra distance; this helped bias me for taking the bus only in the return direction. Since asymmetry is small enough an effect that models can ignore it and still come very close to predicting actual ridership, its effect on transit planning is only on decisions that are very close to begin with. I believe the most common case is the one in the image. A city that transitions from an idiosyncratic network of infrequent direct buses to a regular frequent grid where passengers are expected to transfer needs to decide which of the infrequent buses to keep. It might even have a few peak-only express buses it is considering keeping. In this case, it’s useful to note in which directions the infrequent or peak-only buses are more likely to get passengers, and potentially have an asymmetric number of trips on those in each direction, recycling the equipment for nearby routes whose asymmetry goes in the other direction. Houston booster and blogger Tory Gattis has a theory of what he calls opportunity urbanism, i.e. a focus on upward mobility as the primary goal of urban policy. Responding to a post of his on The Urbanophile, in which the comment thread veered to a comparison of Houston and Vancouver, I noted that the US is actually much less upwardly mobile than Canada (follow links to studies here, e.g. this, with the father-son income elasticity on PDF-page 34), and that the Joel Kotkin report about opportunity urbanism that Tory contributed to does not, in fact, bring up any upward mobility facts arguing that Houston is at all better than the rest of the US. The first step in failing to combat any social problem is failing to recognize one exists. The US loves to congratulate itself about its acceptance of immigrants and to compare itself favorably with Europe’s racism; somehow, the facts that hate crimes happen on both sides of the border and that in the last few years Al Qaida has successfully recruited American-born Muslims do not count. Even the lack of visas for unskilled workers in the US, and the stingy visas for skilled ones, turn into an America-is-great argument, which is exceptionally inconsistent from someone who, on issues of domestic migration, trumpets Houston’s lack of zoning and blasts the restrictions on development on the coasts (which can be thought of as immigration restrictions, only space is auctioned by market pricing and not by quotas for immigrants). To reiterate what I said last year, good policy for integration is to treat immigrants as people rather than as either a problem or a solution to a problem. – Where we speak the language. The entire Anglosphere is a top destination for intercontinental migration, just as France is a top destination for West Africans. Observe this table of immigrant population by OECD country. A key clue that language matters is the difference between the various Scandinavian countries, which are quite similar to each other. Sweden, Denmark, and Norway have very similar languages, arguably just dialects of one language, and on top of that, Finns learn Swedish in school (Finland is the top source of immigrants to Sweden). Finland has a different language, which at least locally is considered very difficult to learn; it also has a much lower foreign-born percentage than the others. – Where our skills match up with the local business clusters. The US happens to be strong in academics and fields that come out of it, like biotech, and those tend to be very porous to international migration everywhere. – How easily we can elbow our way into the local social networks. This is not the same as domestic mobility. For example, my experience with Ivy social networks is uniformly positive; even when I’m the only non-American in the room, which is frequently the case at the gaming groups I’m involved in, I’m treated like a human being and not like a freakshow. It’s very easy to assimilate to the educated New York subculture if one wants to. But this is not true for domestic migrants: my It’s Complicated, a Kansan Harvard student of middle-middle-class background, does not feel as welcome in this subculture as I do, and tells me that at Harvard people treat her like a Real American, i.e. not a real Bostonian or New Yorker. The correlation between social mobility for immigrants and social mobility for the native-born is far from perfect. – The presence of a preexisting community of immigrants from the same culture (not terribly relevant to me, but critical to others). This favors large cities and traditional gateways, like New York, Los Angeles, Toronto, and Miami. I’ve read a few case studies and stories of Brazilians in the Boston area; once the first few come in, news of their success spreads to their hometown, and more people come in to the same area. One good reference is God Needs No Passport; there are others I no longer remember. Likewise, Turks prefer Germany, and former Yugoslavians prefer Germany or the rest of Germanic Europe. – What’s nearby. The US has a lot of immigration, but a huge fraction of it is Mexicans (right on the border), Puerto Ricans (can come in without restriction), Central Americans (close and can speak the language as many other immigrants), and non-Hispanic Anglophone Caribbeans. Likewise, in Germany the top sources of immigrants, excluding intra-first world migration, are Turkey, Poland, the former Yugoslavia, and Russia. – Perceptions of opportunity and wealth, which aren’t exactly the same as opportunity and wealth. The US of the imaginations of Israelis and Singaporeans is not the same as the real US. For example, until I started hanging out in American political forums in 2002, I had no idea the US didn’t have universal health care. It somewhat blurs issues like social network porousness, but those issues have a real impact on whether one can get a job, and this information is somewhat more easily available to outsiders. Take all of the above with a grain of salt. Not that the numbers I bring up are wrong, but my thinking of which numbers are relevant comes from a specific set of experiences, and what someone whose primary social network is Mexican immigrants to California may have a different idea of what’s important. We’re all very confident about our knowledge about things that there’s nobody around to correct us (and I’m saying this very self-consciously). That said, I do know these issues a lot better than the average native-born American. To me, the question of where to live was nontrivial. For political reasons, circa the height of the Iraq War, I wanted to go to Canada, but I also knew that the US had better grad schools, and now to the extent that I have control over where I live, my social network is Northeastern. The most troubling part of the entire exchange above was the invocation of “Revealed preference.” Ordinarily, this is a matter of technical questions about people’s mode choice in real-world situation, and is great at predicting how people will behave if the transportation network changes (e.g. a new transit line is built). It’s an awful way of trying to divine, based on migration flows, whether a country offers more opportunities to people who were born poor in it. Too many intervening variables, too many things most native-born people don’t really see. For that matter, even narrowly, with transportation, it doesn’t answer the question of “What people want?” because it’s much broader than the question of how many people will actually ride a new rail link assuming no change in broader transportation and urban policy. Those of you following my Twitter feed already know this: I’m moving to Vancouver sometime in this summer for a two-year position at UBC. Expect a dramatic reduction in the number of posts expressing exasperation with local transit planning beginning sometime in July or so. I will try to keep writing about the Northeast and not just about Vancouver. I regret to say that I’ve taken down the track maps by Rich E Green that I’d hosted, in accordance with requests by him and by his employer, to whom he sold the maps. This involves breaking past links; I will put notices in past posts of mine that link to them, including a brief description to what is seen in the maps when necessary, and I encourage others to do the same.